The statue, which stands 16 feet tall, is worth $301,170. It has been paid for through hundreds of small donations. However, the memorial site needs more money in order to operate. The memorial plaza will cost $683,020. 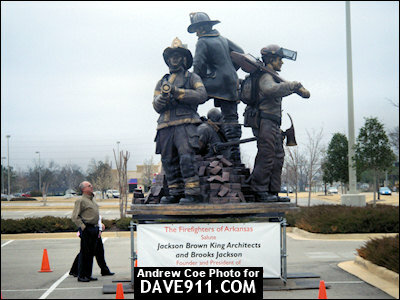 The statue weighs around 6,000 pounds. Some of the money raised has been through the purchase of Vehicle License plates. 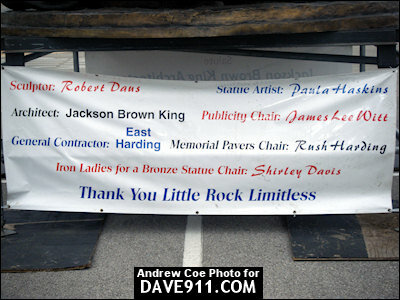 This memorial is a traveling memorial and will end at the state capitol in Little Rock where it will be permanently placed. 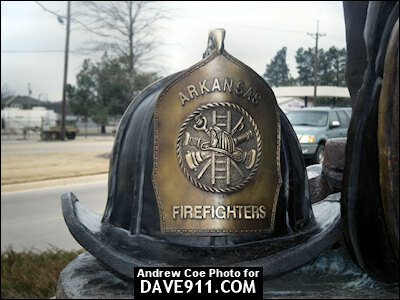 To date, 94 Arkansas Firefighters have lost their lives in the line of duty. Tarrant City Councilman and retired Birmingham Firefighter Junior Jenkins passed away this afternoon. Mr. Jenkins was also the father of Chief Billy Hewitt's wife, Sharon. Please keep this family in your thoughts and prayers as they go through this difficult time. WASHINGTON, DC Wednesday, April 15, 2009 -- U.S. 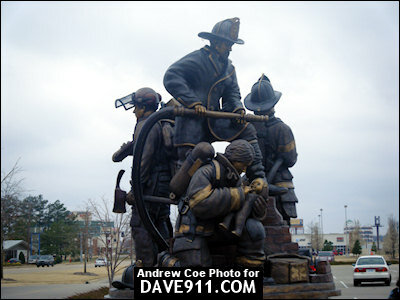 Senator Richard Shelby (R-Ala.), a senior member of the Senate Appropriations Committee, today announced that the application period for the fiscal year 2009 Assistance to Firefighters Grants (AFG) Program is now open. The Federal Emergency Management Agency’s (FEMA) AFG program funds projects to purchase new equipment, improve firefighter health and safety programs, and improve the effectiveness of firefighting and emergency response operations. 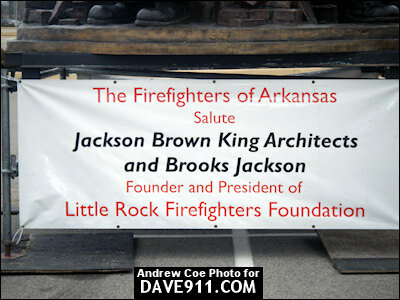 The AFG Program assists rural, urban, and suburban fire departments throughout the United States. Non fire-based Emergency Medical Service organizations may also apply for grants. 1st Annual Cody Renfroe "Celebration of a Life" RoD RuN "Vintage, Street Rods, Hot Rods, & Motorcycles"
The Crossville Fire Department will hold its 1st Annual Cody Renfroe Celebration of a Life and Rod Run. Below are the details from Crossville Fire. If you're proud of it, this is the place to bring it! This car show is in memory of Cody Renfroe, a Crossville Volunteer Firefighter, who gave his life on 10-29-08 doing what he loved most, "Firefighting". Cody had a great love for old hot rods and car shows. Please join us in honoring Cody and the Crossville Volunteer Fire Department. There will also be a dedication of the new Crossville Fire truck and open house of the new fire department! Come join a great event! At an age when many people are still trying to decide what to do with their lives, 19-year-old Christopher Kizziah is in the business of saving them. When Kizziah was 16, he got his GED and began studying at Jefferson State Community College to be a paramedic. In December, at age 18, Kizziah passed the National Registry of Emergency Medical Technicians exam on his first attempt. In 2007, the national registry reported that in Alabama only 38 percent pass the exam on the first try. People in the emergency medical services field say few paramedics are as young as Kizziah. Only fish 15 inches or longer will be weighed in. An off-duty Tuscaloosa police officer was killed Sunday when he lost control of his motorcycle on Alabama Highway 60 near Akron. Officer Claude "Doug" Bates, of Northport, was taken to DCH Regional Medical Center in Tuscaloosa where he died. Arrangements for Officer Bates will be posted when available. God rest his soul and comfort his family. He will be missed. A special thank you to all the men and women who protected their cities and towns while we celebrated with our families. You aren't forgotten.